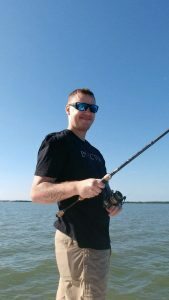 Catching the Cure Backcountry Fishing Charters has begun a fantastic journey with Freedom Alliance by donating private fishing trips for military families going through difficulties. 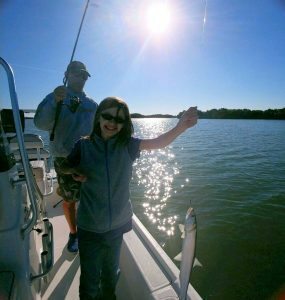 Based in Fort Myers Beach, Florida, Catching the Cure offers backcountry fishing charters in Estero Bay, captained by Jon Fetter, the owner and patriot responsible for the donation. 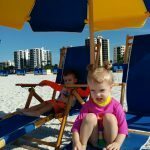 In January, we brought Guy and his family of six down for an overnight stay at the Wyndham Garden, situated on the beautiful Gulf Coast of Florida. The hotel is across the street from the marina where Guy would catch his ride—and his cure—with Captain Jon. Guy was deployed three time to Afghanistan. He was awarded a Purple Heart in 2013 when he was injured by a vehicle-borne explosive, and he is currently going through the medical retirement process. His wife Ramie also served in the military’s medical field. This was definitely a family in need of a beach and a boat. Ramie hung out on the sand with the two younger children, while Guy and his two older daughters spent the day catching trout and other fish. Ramie later wrote to Freedom Alliance: “Captain Jon is by far one of the coolest and most knowledgeable people around! 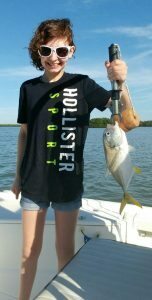 “…Guy said going out with him fishing was the best time he’s had in a very long time.” She explained that smiles like the one he was wearing that day are few and far between since his injury. “My family can’t thank you enough,” Ramie said. We are happy to have had the chance to make Guy’s day and give his family a couple days at the beach. Many thanks go to Captain Jon Fetter of Catching the Cure for helping to make that happen!